Background: Advances in clinical management have improved life expectancy in the ACHD population; as a result, implantable cardiac devices remain in situ for longer periods than ever before. These patients pose unique challenges, including; young age at implant, multiple device procedures during their lifetime, complex venous and cardiac anatomy, and co-morbidities which may predispose to infection. In the non-ACHD population, there is useful long-term research which helps to guide clinical decision-making; however, small numbers and incomplete outcome data has lead to limited comparability against ACHD patients. Aims: This study aimed to examine 20 years of pacing experience in a large ACHD centre, using novel data-mining techniques to generate comprehensive lead survival data. Methodology: A retrospective analysis was performed of pacing and defibrillator leads implanted between June 1996 and December 2016 in a 173 patient ACHD cohort. Automated text searching algorithms with manual review of over 100000 pieces of clinical correspondence was used to maximise identification of outcomes. 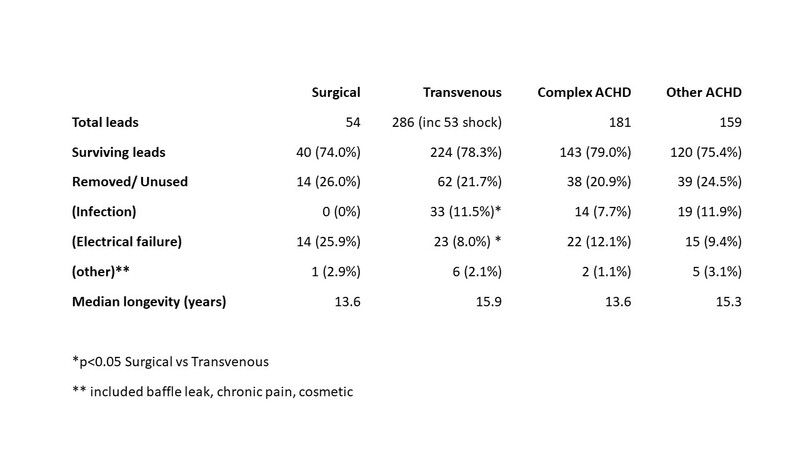 Lead-specific complications, non-elective removal and overall lead survival were compared for surgical and transvenous leads in patients with complex and non-complex ACHD anatomy. Results: 340 leads with complete implant and follow-up data were identified of which 53% were in patients with complex ACHD anatomy and 15% were in patients with tricuspid valve abnormalities. Median lead survival time was 13.6 years in transvenous leads and 15.9 years in surgical leads (p= n.s.) Transvenous leads were associated with a higher risk of major infection than were surgically-implanted leads (11.5% vs 0% p<0.05) while surgical leads had a higher rate of pacing failure or lead damage (25.9% vs 8.0% p<0.001). Complication rates were not affected by complex ACHD anatomy or abnormal tricuspid valve function. Conclusion: In this large cohort of patients with ACHD, lead survival appears to be reasonable regardless of whether a transvenous or surgical approach is used. A higher incidence of infection in transvenous leads is offset by a higher electrical failure rate in surgical leads. Further work examining large cohorts is required to determine optimal pacing strategies tailored to patient-specific anatomical challenges.